These days it’s popular for companies to say that they want design, but that’s not what it is. It’s when everyone at a company is thinking about design – the writers, the administrators, the engineers, even the people selling the ads – not just the designers. When you think of well executed design; probably a well-defined transport system, pixel-perfect layouts and signage, keenness to typography come to mind (sans smart devices) that comes frrom https://blog.enplug.com/what-is-a-digital-signage-player. Design is that something that informs all decisions. And one would be gravely punished for not sticking to the enchiridion. Sadly, that’s a somewhat utopian perspective. In Uganda, for example, the leading daily – New Vision – spent millions of Uganda shillings for the paper’s layout redesign in 2013. This came as a surprise since they had hired a British design agency for this particular project. Many wondered why they hadn’t chosen from the locally available talent pool. Probably this could have lowered the costs. Perhaps, the daily’s directors feared experimenting with the untested home grown design firms. The details surrounding the deal were marred by ambivalence and so was the public’s reaction to the new design. You see, design is excruciatingly subjective and nobody survives the judgement. Well, the term design is grand – product, print, web et al – but for the purposes of today’s discourse we shall focus mostly on digital design. Sired by the stratospheric adoption of mobile technology in Africa, the new wave of designers are not burdened by infrastructure of the past. They will do anything feasible in quest for disruption but they are still not getting it right. For the past years, the seemingly novel tech scene in Kampala has been awash with hackathons, competitions that are responsible for a myriad of startups borne thereof. Even though many don’t live to see their first birthdays, innovators are carrying on with the daily grind; more entrepreneurs are joining the startup entrepreneurship movement. It’s promising. 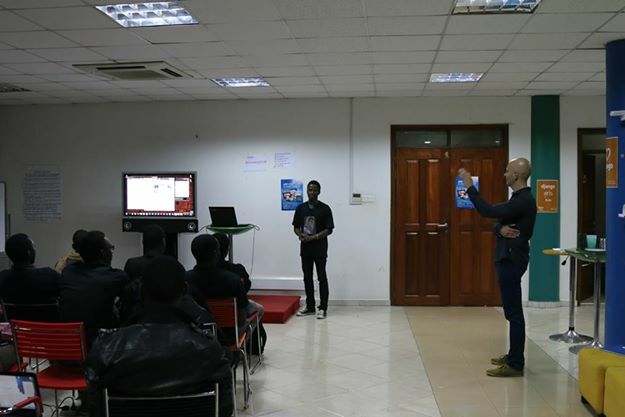 In 2011, Estonian non-profit global startup competition, Garage48, held its first fairly graced hackathon in Kampala, Uganda. The second edition was held later in 2014 and was such a success. It focused more on design; not the art of bending Bezier curves or photoshopping naked models but design as a holistic approach. An approach that puts people at the centre of the process and seeks to find solutions to their pain points. Call it research, design thinking or Human-centered design. As legendary scientist, Albert Einstein, put it, “If I had only one hour to save the world, I would spend fifty-five minutes defining the problem, and only five minutes finding the solution.” A lofty 55 minutes synthesizing the problem and just 5 minutes executing. Prior to the hackathon in 2014, Garage48 sent a resident designer, Helen Kokk, to prepare the would-be participants. After a successful hackathon, another resident designer, Jaanus Sakkis, jetted in to further hone the skills of the entrepreneurs and budding designers alike. From the look of things, it’s not only Garage48 at the forefront, several attempts have been (being) made to impart a strong design appeal to entrepreneurs and innovators. Peni Acayo, a U.S based Ugandan academician has proposed to Uganda’s education board to incorporate design thinking in part of the secondary schools curriculum. Her efforts are yet to bear fruit. Just like Peni, Jaanus doesn’t ply his trade from Uganda. His efforts in building a local design union may go to waste due to lack of stewardship after his departure. Not that there is a dearth of designers in the country. No. The lack of a functional community will probably the cause of its demise. To borrow from Pareto’s principle – the 80/20 rule – 20% of the leading designers are working for top design agencies in the country tucked in mega contracts with trans-nationals and government bodies. They may possibly never surface in the community building struggle because of a plethora of issues, business mainly. The remaining 80% of the designers are widely dispersed and lost in the forest of ambivalence. Since design isn’t really well paying for mid-skilled or amateur designers, they co-opt into other fields. The bold and courageous who insist on pursing the trade fare on low scale and low paying contracts. Just like renown Silicon Valley V.C, Ben Horowitz, in his 2014 book – The hard thing about hard things – the adversities of starting up company/venture with no active community of entrepreneurs who encourage, inspire and learn from each other was one of his lowest points. The sense of community and belonging is second to none, in fact, it’s one of the major pillars to an entrepreneur’s success. This model that is based on a chain of co-working spaces spread overall the continent has done a good job at spearheading startup entrepreneurship. Regardless of the hiccups this model faces, such as self-sustenance, it is such a prime ground for building huge communities. When like-minded people converge, they open the doors to limitless possibilities. Besides, they oft have the support of other community members who may not be in design. One may argue that there are already initiatives in place for fostering such communities such as niche based fraternities privately run by individuals. The difference, however, is that co-working spaces provide more optimal conditions such as mentorship, logistics, and the internet among others. Jaanus recounts; in the early 90s, the government of Estonia and the E.U stepped up in helping the budding designers rake rockstar skills and gain financial liberation. These successes were registered thanks to the design union formed. The mind-boggling questions still stand; how do we get the remaining 80% improve their skill, solve problems, receive wide-acclaimed recognition for their work, land massive contracts, and perhaps change the world (cliché, I know)? The answer is sure not hidden behind creating the next shiny app interface. It starts with identifying problems and solving them – one problem at a time.